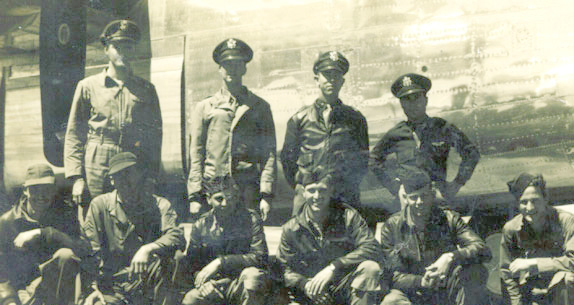 The Daly Crew was one of the original crews for the 492nd BG that trained in Alamogordo, New Mexico. They transferred in as Crew 1636 from the CCTS (Combat Crew Training School) in Biggs, Texas, on 3 Mar 44. They were assigned to the 856th BS, designated as Crew 605. Lt Robert Daly signed out for B-24J 44-40102. Their plane was named HEAVEN CAN WAIT. In April 1944, they flew their assigned aircraft to North Pickenham, England, via the southern route. Capt Chillcote, the Group's Aircraft Engineering Officier, accompanied them, thus bumping Sgt Williams onto the Queen Elizabeth. By our count, Daly flew as the Aircraft Commander for Crew 605 for a total of 5 missions. Records show that there was one personnel change on their roster. However, it doesn't add up. Sgt Anzolone, originally with the Robert Murray CCT Crew 1662, flew over with this crew but flew his combat missions with the F Haag Crew 611. Sgt Williams, an original CCT member of this crew, isn't listed on any roster (boat or plane) going to England, but was flying with this crew when they were interned in Switzerland. Crew 605 and their assigned ship did manage to survive the air battle encountered by the 492nd on 19 May 44 during their raid on a marshalling yard in Brunswick. With one engine gone, they were barely able to limp back to England, landing at the first base they could find, a British Mosquito base. Velarde flew over and picked them up. On 27 May 44, their ship got shot up again while attacking a marshalling yard at Saarbrucken. The flak cost them two engines and a damaged rudder. With the plane crippled and not having enough fuel to reach England, Daly made the decision to go to Switzerland to be interned. The 10-man crew set down at Cointrin Airfield near Geneva. MACR 5209. According to reports, Lt Daly escaped internment in Switzerland and returned to England in mid August of 1944. Later on Lt Brown tried to escape but was caught. Sgt Siemens escaped at different time. His story can be found in the book, REFUGE FROM THE REICH by Stephen Tanner. At this time we don't know if the others tried to escape.